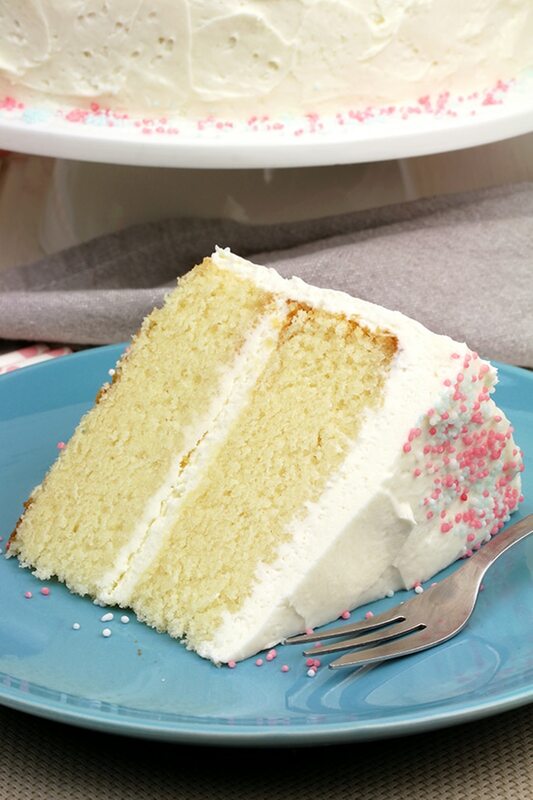 This Vanilla Cake with Whipped Cream Cheese Frosting is perfectly moist, easy and airy vanilla cake with filling made of vanilla cream cheese and heavy whipping cream. This is my son‘s favorite cake and I am preparing it for his birthday. Time goes by so quickly. My son has just turned six and I am so happy and proud of him. We tried our best to spend his birthday together and in a good mood. I wasn‘t thinking much about which cake to prepare. It was, of course Vanilla Cake with Whipped Cream Cheese Frosting – his favorite. 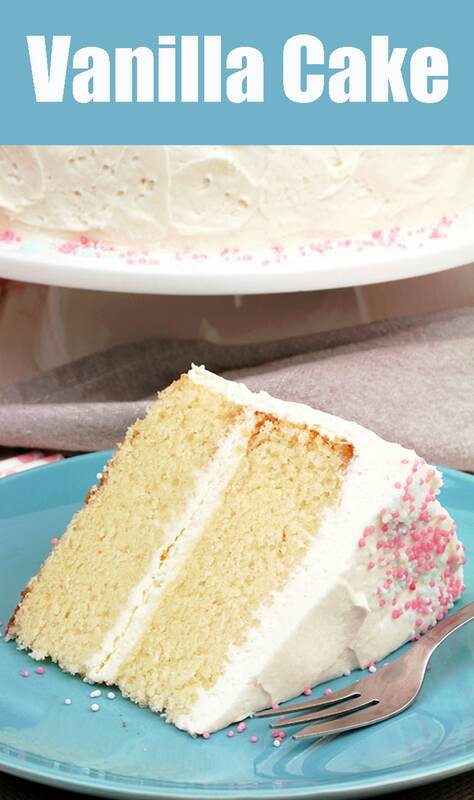 What do you need to make this Vanilla Cake with Whipped Cream Cheese Frosting? Everybody likes this simple and yet so effective cake. Its perfect taste will complete your special moments. 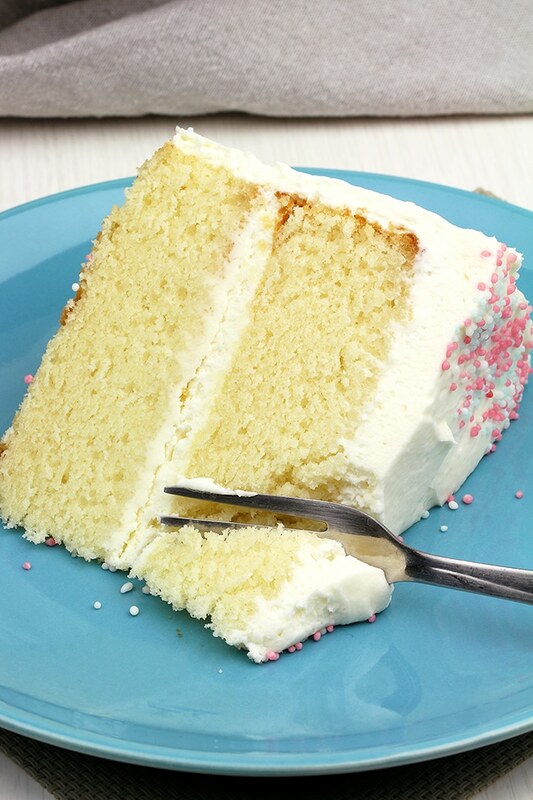 It is creamy white, but you can color the cake and the frosting the way you like, depending on the occasion. 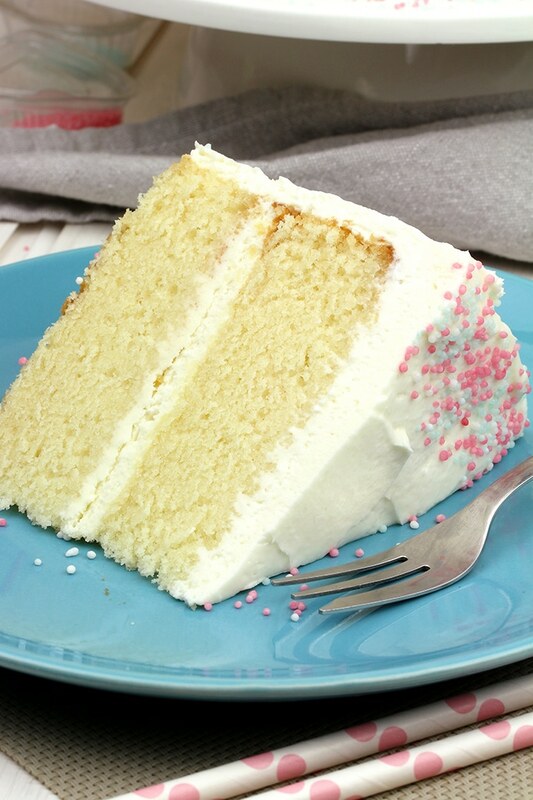 How to make Vanilla Cake with Whipped Cream Cheese Frosting? Preheat the oven to 350 F. Line 2, 9 inch cake pans with parchment paper and put some butter on the sides. In a large dish combine flour, cornstarch, baking powder and salt. Set aside. In a separate dish beat butter and sugar, at high speed, until light and fluffy, for about 3 minutes. Add eggs, one at a time and vanilla,beat until creamy. Add ½ flour mixture and beat at a low speed until combined. Add milk and continue beating until combined. Finally, add the rest of the flour mixture and beat for about 2-3 minutes at medium speed. Spread into 2 cake pans. Bake for 35-40 minutes, or until a toothpick comes out clean or with a few crumbs on it. Take out of the oven and leave for a few minutes to cool in cake pans, then transfer to a wire rack to cool completely. In a cool large dish, beat heavy whipping cream with electric mixer until stiff peaks form. Set aside. In a separate large dish beat butter and cream cheese, at medium speed, until creamy and with no crumbs. Add powdered sugar and vanilla and mix until smooth. Fold into the whipped cream. 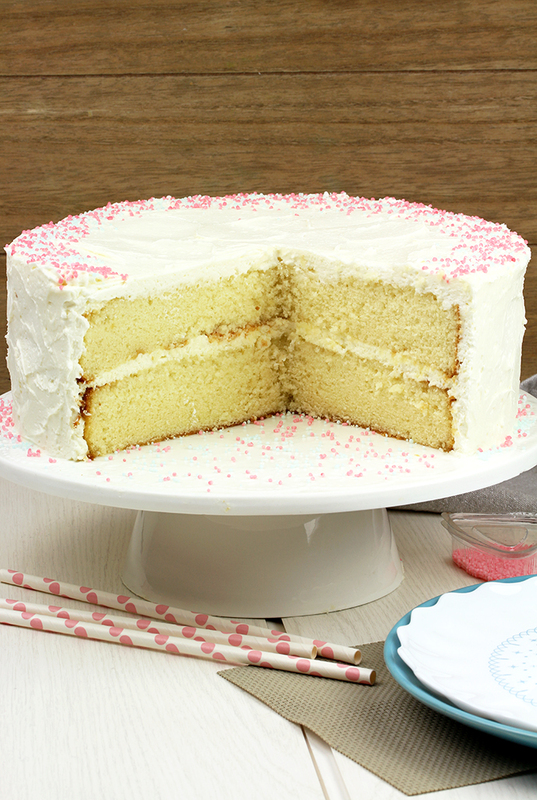 Place one layer of vanilla cake on the bottom of a cake stand or a plate. Spread ⅓ of frosting over it. Put another vanilla cake layer and press lightly. Spread the rest of the frosting on the top and on the sides of the cake. 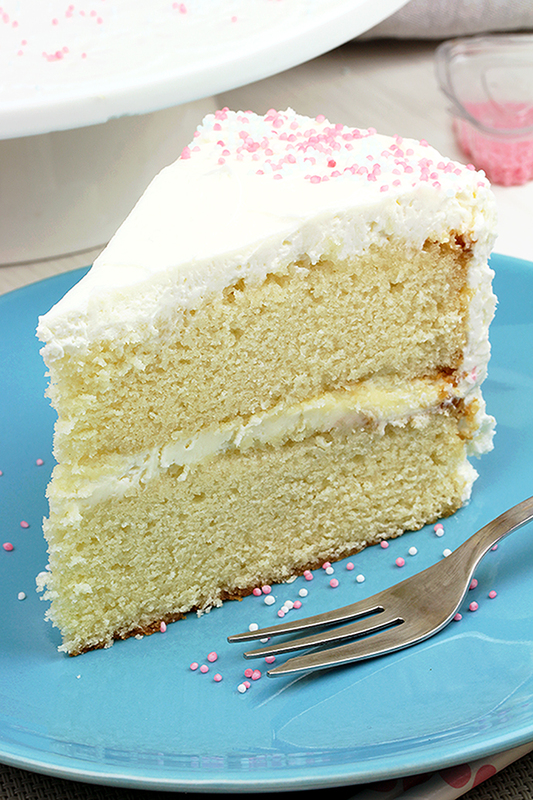 Nothing can beat the taste of a homemade vanilla cake. 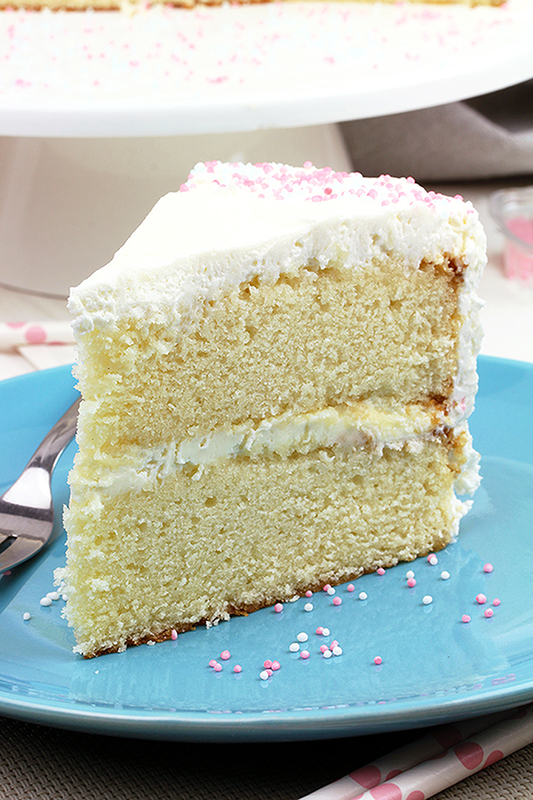 One bite is all it takes to fall in love with Vanilla Cake with Whipped Cream Cheese Frosting. All you need are standard ingredients, like cake flour, baking powder, salt and an ingredient that gives fine texture and white color – cornstarch. Wet ingredients you need are milk, eggs, butter and vanilla. Cream Cheese filling is not standard, because I‘ve made some changes, I actually added heavy cream. A small quantity of heavy cream gives it a milder taste, that kids will love. My son loves the filling made like that. Moist, light and airy cake with cream cheese, heavy cream and vanilla filling is just what you need. You will love its perfect combination of flavors. If you have a sweet tooth check out the page Cake and Desserts on our blog. Make your loved ones happy with Vanilla Cake with Cream Cheese Frosting and enjoy its fantastic taste together. Keep refrigerated up to 5 days..